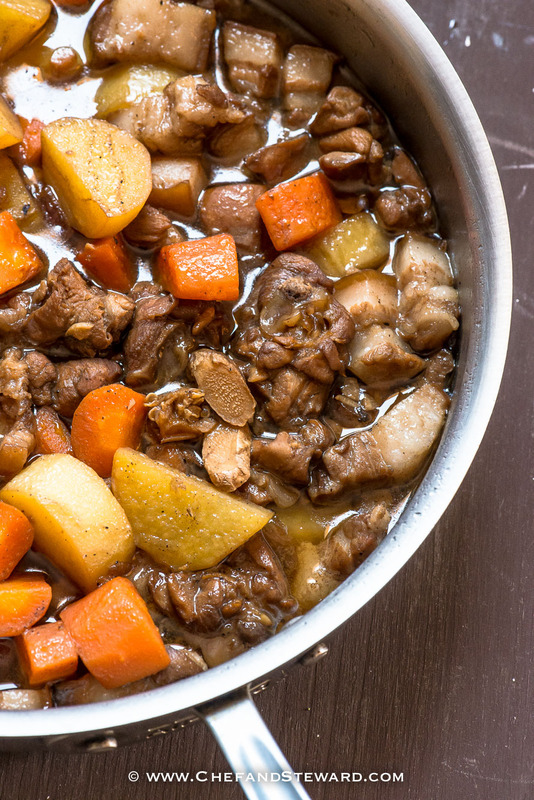 There are few things more satisfying than a hearty meal of Filipino Adobo. What’s there not to love about this pot of of salty and every so slightly tangy, tender, juicy bits of meat and root vegetables? The one thing about living in the UAE is being able to meet with people from all over the world. One of the things I love about my Pinoy friends is their love for good food. Filipinos have pretty awesome palates and their cuisine reminds me so much of the multicultural fare from our Jamaican homeland. 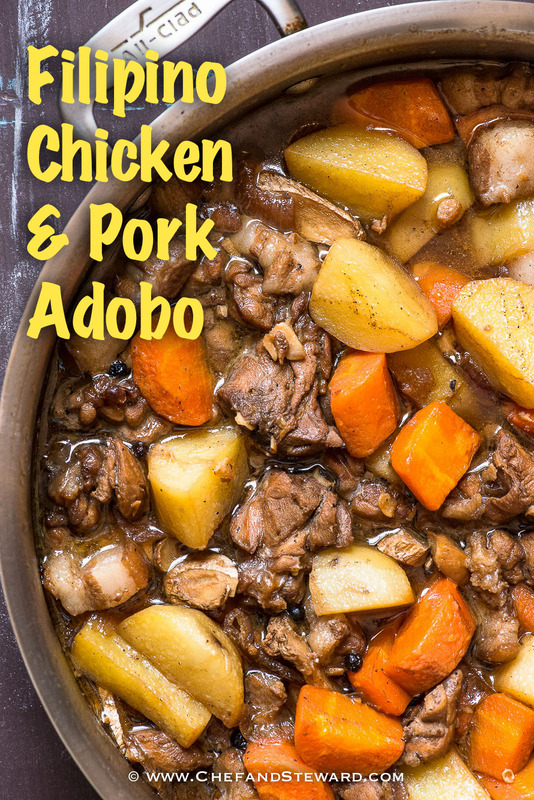 Adobo is quite similar to a Jamaican Stew Chicken. If you love it, put a Pin on it (below)! I’ve known how to make Chicken Adobo for several years and in fact, I shot a recipe for it years ago that is still in our archives. It wasn’t until I was bragging about the fact that I knew how to cook great Chicken Adobo, as taught by Mel, a lovely Filipina lady who worked with us in Dubai, that our British friend, Bev Spencer schooled me that I was missing out on the special Mixed Adobo. But there is no day like the present. And now, Wynne, who is my assistant and has come up with a practical Shepherd’s Pie for Chef and Steward, has struck again. Ladies and Gentlemen, without further ado, I introduce you to the spectacular event that is the Filipino Chicken and Pork Adobo. 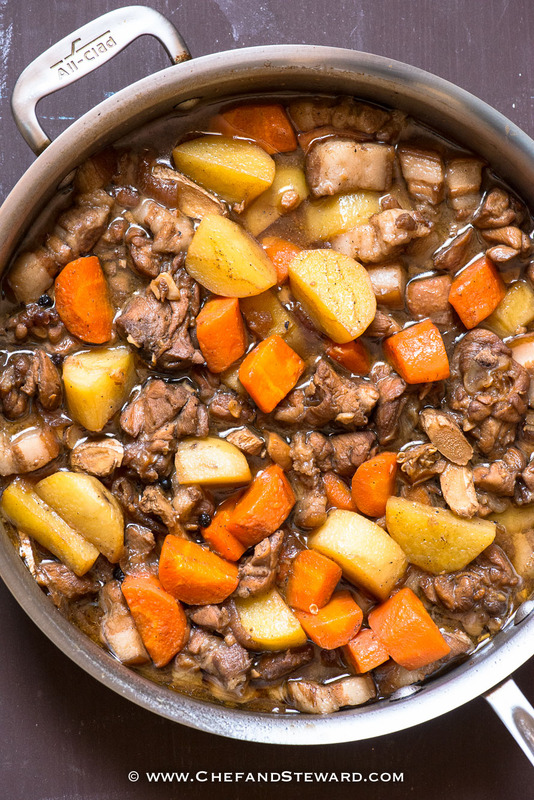 The ginger in this recipe is from our friends Ading and his wife Rhona, who always add it to their Adobo. This is the meal to make with the chicken you have thawing. This is the meal to make over and over and over again because I promise you, your tastebuds will never tire of this. As the winter chill sets in, grab a bowl of hot rice and scoop some of this Adobo over it and eat it with a spoon like a Filipino. This WILL become your comfort food of the season. That much I promise. The facts that it contains only a few ingredients and would be senstional in a slow cooker, are just bonus points. This is the recipe to end all chicken recipes. Never wonder what to do with chicken again. Guaranteed to become a family favourite! Season chicken and pork with soy sauce, vinegar peppercorns and ginger and set aside to marinate for 2 or more hours. Return empty pot to heat and saute onions and garlic for a few minutes. Do not allow them to turn brown. Add the chicken and pork and marinade along with enough water to cover chicken. Bring to a boil and reduce heat to a simmer and cover pot. Once cooked, add potatoes and carrots and cook until soft, if needed, top up with warm water. Once potatoes are cooked and sauce is reduced, taste the sauce. If it isn't salty enough, add a little more soy sauce in increments tasting each time. Skim off any visible excess oil from top (if so desired). Serve over a bowl of rice, preferably cooked without salt- the Filipino way. This looks really delicious!! Thank you for sharing this recipe. Thanks so much for stopping by! We love to share really practical recipes for the home cook! For a European or French twist, you can add a cup of wine (it doesn’t matter whether it’s red or white, but red wine gives the dish a nice color). Add a couple of bay leaves too, plus a star anise flower. Adrian that wine plus soy sauce?